Holiday candy is everywhere these days, so today I thought I’d share three of my favorite desserts to help you naturally satisfy your sweet tooth. What I love about these desserts is that they’re quick to prepare and call for ingredients you most likely already have on hand– so it won’t be long before you can indulge! Check out my latest video below to see these three easy desserts, along with the links to each full recipe. Reader Feedback: What’s your go-to healthier holiday treat? Around this time of the year, I like to have the peanut butter bars above or my homemade peanut butter eggs on hand to avoid the Reese’s pumpkin temptation! Hi Megan! Definitely going to try some of your luscious Halloween treats, except I’m making them for milk chocolate lovers/dark chocolate haters. Do you have any good milk chocolate recommendations for me? Megan ~ you are so cute in this video! And you have such a cute accent. My husbands favorite would totally be the peanut butter bars as well. We just attended Fall Fest which was doing all these fundraisers for great causes and we all were supposed to bring a no-bake recipe to auction up to raise money. These would all be awesome choices, especially considering that most of the recipes had the bad white sugar in them, but I know lots of people attending don’t eat white sugar anymore (myself included!!!). Thanks Megan! 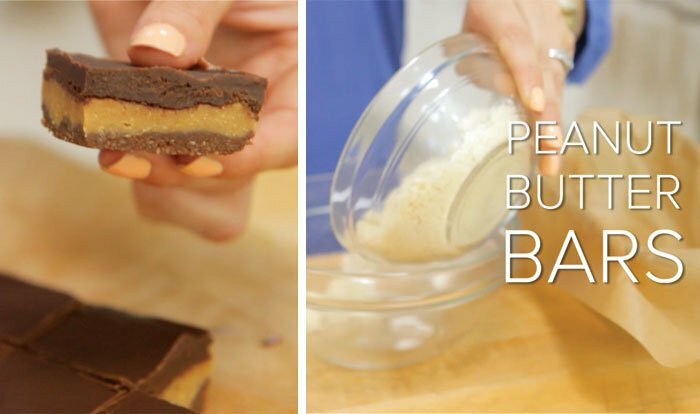 i need to try those pb cup bars! They look epic, as well as the other desserts too! Yum!